Ever since T.M. Frazier introduced this fireball known as Rage in Soulless, I knew that I couldn’t wait to get my hands on her story and discover why she is ALL THE RAGE. Hope is different. She does not conform to what others expect of her. She has a different way of thinking and feeling. She doesn’t see sadness, despair, or loss when she witnesses death or violence. She doesn’t shy away from pain, hurt, or destruction. Her anger fuels her. It makes her different. Hope was just her given name but in true form she was Rage. So when Rage embarked on her new life shedding any evidence of Hope, she lived the life she felt was meant for her. 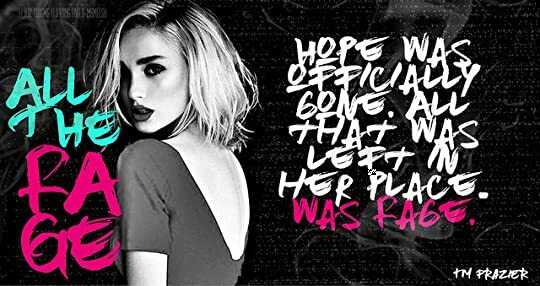 The only piece of Hope that existed was with her parents in whom she kept in contact with but they didn’t know the real Hope that embraced her new identity as Rage, a nineteen year old killer. When Rage meets Smoke, he changed her life and helped her to be the person that she is today. Someone who is efficient and gets the job done. If you wanted someone to kill someone without a remote of conscience, Rage is that person. And so when Smoke assigns her to watch over this guy and get details on where his parents are, Rage begins to feel something. Nolan was just supposed to be a target. Get the information and when the order came to kill him there should be no hesitation. But Nolan was different. He challenged Rage. He gotten under her skin. Nolan saw the real Rage. And soon all the walls that Rage built up with lies soon began to crumble. Cracks on her solid foundation began to show. And when Nolan stripped off Rage’s vulnerability, he saw her. Truly saw the real Rage. The real Hope. He saw the woman that was meant to be his. So will Rage be able to let Nolan in or will she be forced to kill the only man that she truly loved? Her first love? All the Rage was everything and so much more. Ms. Frazier truly delivered a heroine that was badass and yet that had the soft side. I loved that Ms. Frazier was able to strip down her characters and show every facets of them from the good, the bad, and the ugly. Tracey has a way of making her imperfect characters truly perfect as she grips and consumes her readers to feel all the passion, the heat, intensity, and of course all the rage. The writing and story line of this book was on another level where Ms. Frazier slowly dissected every facets that makes up Rage, in which allows readers to see that she is who she is. So if you are ready to find out what’s all the rage about Rage and Nolan then I urge you to read this book because in true T.M. Frazier fashion, she delivers a story with epic proportions of heart, grit, intensity, and passion. All The Rage was unexpectedly good. Before reading Rage I didn’t know what to expect. I thought this girl was downright mean and cold hearted and evil. But what we get is completely different. When it comes to Rage nothing is easy, as she is a complicated person. She never does what others expected, she is a smart mouth, a smart girl and tough as nails. Rage never realized that she live her life with passion and love was just one guy away. Rage never knew that love existed within her, until she met Nolan. Nolan was good looking and sweet, with Rage he is anyway. Before Rage he had his booty calls. But after getting to know Rage, he didn’t want anyone else but her. Rage was tough around the edges, but deep inside she just wanted to be loved..even though she didn’t want to admit it to herself. Nolan made feelings come out of Rage, with him she wanted more. As for Nolan he felt the same. Nolan wanted to own Rage and he would kill for her if he had to. They were a match made in MC Heaven. Smoke knew exactly what he was doing when he pushed them together. Rage and Nolan’s relationship started out easy and sweet, until Rage ran from him and ran from herself. As Nolan found ways to get Rage back and made her see that they belonged together, complications got in the way. Nolan and Rage’s story was sweet, raw and exciting. They were hot against the railing of the pier or in Nolan’s room. Together they were smokin. I love them together.